Power Quality (PQ) problems are of increasing concern in the present industrial scenario with the progress in application of adjustable speed drives (ASDs) involving power electronic (PE) converters. One major power quality problem is the harmonic distortion generated with the PE converters in ASDs. It affects both the utilities and the customers of these converters. A cycloconverter-fed adjustable speed drive system is well established and find applications in synchronous/induction motor of large power rating like cement mill, rolling mill, ore grinding mills, mine winders and ship drives. The peculiar and complex nature of the frequency spectrum in this type of system involving inter-harmonics and subharmonics demands for quantitative assessment and improvement of their power quality. 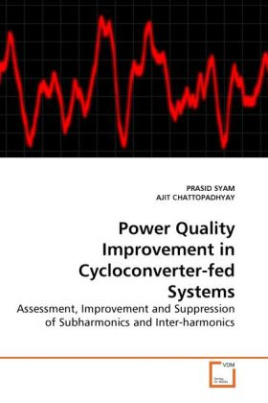 This book has defined the PQ indices for a cycloconverter-fed system, examined how they are affected by a simple method for suppression of low frequency subharmonics/inter-harmonics in the system, realized in practice and provided test results to show the effectiveness of this method. The content of this book will be useful to the researchers, manufacturers and users of these drive systems.